Picasso’s prodigious output of prints, spanning all seven decades of his career, is characterized by constant experimentation and technical ingenuity. Different printmaking techniques fueled his creative energy, as each method presented distinct means and possibilities for expression. The stimulus and support Picasso received from his master printers were critical to his exploration of graphic art. His first decades of drypoints and etchings tend toward more conventional applications of technique—but in the mid-1930s, the artist adopted a radically new and bold approach when he began his close association with the printer Roger Lacourière. 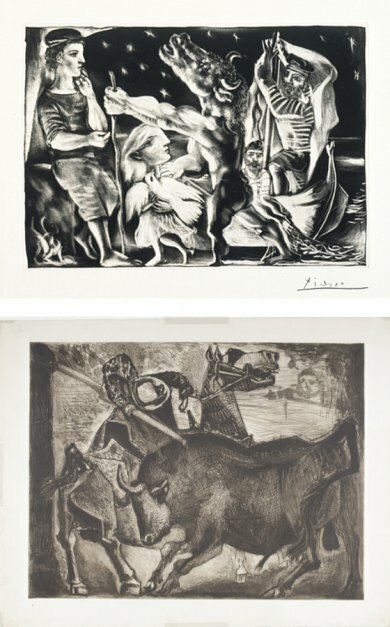 Similarly, in his later collaborations with the printers Fernand Mourlot in lithography and Hidalgo Arnéra in linocut, Picasso pressed the boundaries of what could be realized in each medium. Through his cooperative work with printers, Picasso sustained his lifelong commitment to innovating techniques, often through unorthodox methods. Largely drawn from LACMA’s collection, Picasso and His Printers celebrates the great achievements of these vital collaborations.